2.2 Protection against ultraviolet radiation. 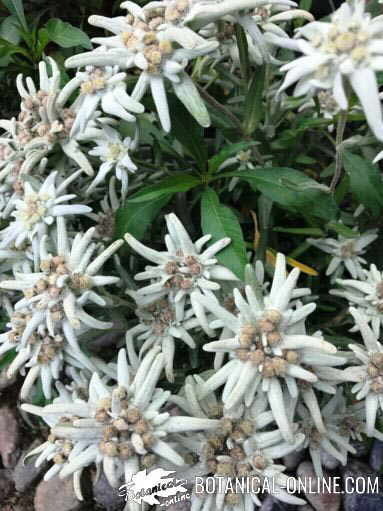 Edelweiss or snow flower (Leontopodium alpinum) is a plant of Asian origin that settled in the mountains of Europe and holartic regions of the world during glacial periods of the planet. Currently, its distribution reaches the highest mountain areas of Europe and Asia. It is characterized by inhabiting inaccessible areas, such as ravines and rocky terrain, at altitudes of between 1,500 and 3,400 meters. It supports typical adverse conditions in the mountains, as high levels of ultraviolet radiation, low atmospheric pressure and extreme temperature and humidity. Because these growing conditions, the plant has developed extraordinary adaptation mechanisms, such as rhizomes resistant to withstand the strong winds and dense tiny hairs on leaves and stems that prevent evapotranspiration or thick sap to prevent freezing. Snow Flower is an outstanding plant of great ecological interest currently being endangered. Phytotherapy with edelweiss is limited to those samples that have been cultivated in laboratories. Edelweiss collection in the wild is prohibited in most countries. From the adaptive factor of snow flower to heights derives its capacity to protect itself from ultraviolet exposure at the high peaks of the European and Asian continents. An analysis found an exceptional concentration of flavonoids and phenolic acids that fight the effects of ultraviolet radiation, helping to protect the skin from exposure. Edelweiss is an ingredient that can be found both in cosmetic creams and sunscreens to protect our skin from radiation, in concentrations of between 3 and 5% of its composition. From the same premises, There was a suspicion that this plant should have a significant antioxidant potential to resist oxidation caused by ultraviolet rays. In effect, the extract of edelweiss is marketed to add an ingredient in cosmetic creams and sun because it has a high ability to scavenge free radicals, worth FPR * = 286. (* FPR = Factor radical protection). The antioxidant activity of this delicate flower is twice the antioxidant power of vitamin C.
Antioxidants or substances able to fight free radicals that are oxidizing components have anti-aging effect. That is, by means of preventing oxidation of the body, they prevent their premature aging. For example, people with smoking habits should increase the dose of antioxidants in their diet or in cosmetic creams since snuff is very oxidizing and aging for the skin. The extracts from roots and aerial parts of Edelweiss have anti-inflammatory properties, and its extract has been shown to be effective for treating dermatitis and fluid retention. Part of this effect may be due to the antioxidant potential of the plant itself. The active constituents are sesquiterpenes with anti-inflammatory function, as bisabolene; tricyclic sesquiterpenes, coumarins and lignans present in root extracts. Formerly Edelweiss was a natural remedy against infections such as tonsillitis, pharyngitis, ear infections or bronchitis. One study found Edelweiss antimicrobial effects for Enterococcus faecium, Escherichia coli, Pseudomonas aeruginosa, Staphylococcus aureus, Streptococcus pneumoniae and Streptococcus pyogenes. The results of the study confirmed the bactericidal properties of the plant, confirming its traditional use in the treatment of respiratory and abdominal disorders. Snow flower was formerly used as a medicinal herb in decoction with milk and honey. This preparation was used to combat heartburn and difficult digestion. 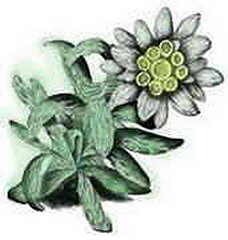 – Not health hazards have been described using edelweiss in medicinal preparations. – Edelweiss is NOT EDIBLE, so it should not be used for food. More information about edelweiss properties.